Kash is introducing an innovative, multi-currency, wearable hardware wallet, the Vault 1.0 along with an intuitive, user-friendly, compatible software wallet. As cryptocurrency purchases increase, so does the threat of hacking by cybercriminals. The impenetrable nature of cryptography, hence cryptocurrency, and the security that it provides is rendered useless without a secure way to store private keys. The protection of private keys is quintessential to public key cryptosystems. Therefore, we are committed to giving our best efforts in providing the safest offline storage hardware and software. Our hardware wallet, the Vault 1.0, is the solution to storing your private keys on a secure device. Our hardware wallet is not your average wallet. We are the only company thus far to introduce accessories and wearables to a hardware wallet. The Vault 1.0 is our first rendering in a long line of successive hardware wallets that we plan to introduce to the market. They key feature of the Vault 1.0 is that it can be stored like the typical hardware wallet available today or transformed into wearable. It can be worn on the wrist or neck with our sleek silicone wrist and neck bands. The Kash desktop wallet functions without the Vault 1.0 allowing easy access to your funds, while you control which funds to store and keep in your vault. The wallet supports 12 of the top currencies by market cap, with more that will be added in the future. As the mass adoption of cryptocurrency draws nearer, we intend on growing with the market and becoming a major player in the offline/cold storage space. The number of bitcoin users is predicted to reach 200 million by 2024, which means that cryptocurrencies will have effectively penetrated the mainstream market, which currently provides the Kash brand an opportunity to seize a large share of the global market early on. 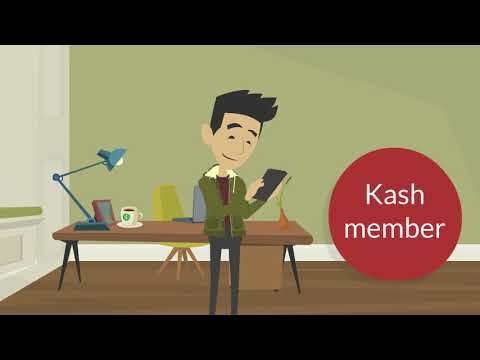 Participating in the Kash token sale comes with the added benefit of becoming a Kash Member. Kash members receive a 20% bonus on their contribution in the token sale every month for one year, discounts on Kash products, and voting rights regarding the direction of the token such as exchange listings and new features on Kash products. • Third Kash token distribution for members 10.1.2018. • Sixth Kash token bonus distribution for members. • 7th, 8th, 9th distribution of Kash token bonuses for members. • Pre-orders opened for Kash members only.